The Temple of VTEC - Honda and Acura Enthusiasts Online Forums > Type R > > Re: Bought one on a whim! 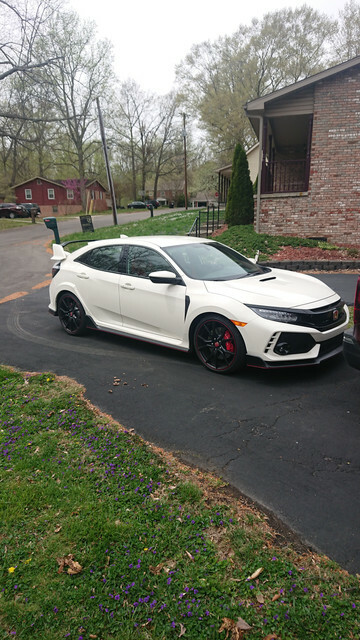 TOV Forums > Type R > > Re: Bought one on a whim! Looked Thursday, picked one up yesterday. Ten hour round trip drive but it was worth it. I'm a new owner of a Championship White Typr-R. This thing is stupid good...better than expected. If you're on the fence, do it. I'll post a picture later. Wow, that's awesome!! Welcome to the club! You are absolutely right, it is a spectacular car. Congratulations Dren. A really great car. You’re the man to enjoy it ! Congrats! I checked out an Aegean Blue Metallic one in person. Enjoy the ride. Yep, stupid good sums it up nicely. You tell people how good it is, and they think you're exaggerating. Congrats! I've had mine about a month and couldn't be happier. Can't wait for the weather and tires and asphalt to warm up to get better grip. Congratulations, a first rate performance car. I've really gotta take one out for a spin soon. I really dig this car in Aegean Blue. Awesome. I just received my VIN and am told I am about a month away. More on your impressions please. I better dig back in post history, Dren...I hope you weren't like me and flipped your stance once you saw it. I tried to tell Owe that...once you drive it and feel what it is all about, everything else falls by the wayside. A little back history. I owned a couple CRXs, daily drove an 07 Civic Si, a super charged BRZ, and had an AP2 S2000 for several years. I also recently drove a 2018 Si sedan. This car feels like it pulls harder than all of those, has better brakes, better suspension, better handling. It doesn't sound as good as the S2000 since the turbo muffles the engine; it has more of a mean grumble. The steering in R mode is heavier than all but the non-power assisted CRX. The shifter is short and feels like it's a linkage, not cable, but I'm not sure if it is or not. The shifts are nice and precise. The clutch is great, much better than the 2018 Si. I actually like the rev-matching downshifts and somehow overlooked that feature on the spec sheet. It was a nice surprise. The seats hug you and were comfortable on a 5 hour drive though they require a little extra effort to get in and out. The first time I really pushed the car was a bendy S shaped on-ramp after a pit-stop. That put a huge smile on my face. You're going to enjoy it. There's a bit of turbo lag, but it's not like the old digital lag early turbo cars have. The power surges when the turbo spools, but it's smooth, and there's plenty of rev range to enjoy, so it still feels a bit like older high revving Hondas. Oh, and there's a knob to adjust the volume of the radio. Funny, now that I have owned two Honda's that didn't have the knob...I haven't used the knob. The car just feels like it's effortless through twisty roads. Yeah, it's pricey for a Civic, but worth every penny. The shifter is short and feels like it's a linkage, not cable, but I'm not sure if it is or not. The shifts are nice and precise. I sat in a Type-R last weekend that had the Acuity adjustable short throw shifter and upgraded bushings. This was an incredible difference over stock, and even simply upgrading the base bushings and cable bushing is supposed to improve it quite a bit, but that short shifter felt like you were cocking a shotgun...just *click* *click* *click*. I am going to do the bushings kit at least and hope it gives me some of that feel without dropping in the entire kit. If you get the busing kit, let me know what you think. I'm pretty happy with the throw distance right now, but if the busing upgrades the 'feel', I'd be interested. I'm not surprised it's a cable shifting MT since it's a new Honda, but I am surprised that it doesn't feel like the unconnected cable MTs that my other Hondas had.